Marcus Maddison of Posh flies through the air after a Scunthorpe tackle. Photo: David Lowndes. Scunthorpe United appear to have mastered League One football. German-like efficiency and organisation has led to a remarkable run of form for a club more Burton than Bolton in terms of size and reputation. But we all know what Burton achieved at this level last season. Posh midfielder Michael Bostwick chases Scunthorpe's Tom Hopper. Photo: Joe Dent/theposh.com. Four defeats in 39 League One matches spread over the last 10 months is a stunning effort by Scunthorpe and it’s against that background Posh must dissect their own performance last night (November 22). Posh were poor in comparison to their visitors, but there’s no shame in that. Grant McCann, a legendary figure in both camps last night, might just have worked a managerial miracle to get his side into the play-off spots when there is no obvious individual source of goals in his squad. Certainly Scunthorpe’s work-rate, organisation, tactical ability, and the sheer confidence that comes from rarely losing, indicated how far Posh still have to travel to maintain their status as genuine promotion challengers. The visitors adopted a high pressing, high tempo game that completely befuddled a Posh side who started the night in strong form themselves. Posh were denied the opportunity to play out from the back, failed to control the ball adequately under pressure in midfield areas thus leading to a succession of first-half high balls which were gladly gobbled up by a dominant back four. 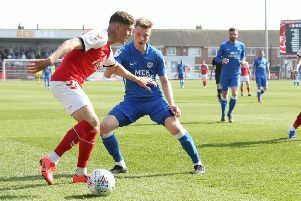 This Marcus Maddison cross just eludes Posh centre-back Ryan Tafazolli. Photo: David Lowndes. That was the case until Lee Angol’s ability to hold the ball up and Gwion Edward’s attacking dash were belatedly introduced at half-time. Posh had a decent little spell for 20 minutes of the second period, created a couple of chances, but Scunthorpe soaked it up and finished the stronger, adding a second goal from impressive midfielder Neal Bishop eight minutes from time. Dutch striker Kevin van Veen had opened the scoring with a close range header midway through the first half. In contrast to Posh, the visitors were always neat, tidy, precise and patient in possession. They won the ball back quickly on the rare occasions they lost it and earned a succession of free kicks from frustrated opponents. Stephen Dawson was afforded far too much time and space on the right-wing to pick out van Veen with a terrific cross for the opening goal. The second arrived from a poorly defended corner which Bishop, a terrific athlete for a 35 year-old, threw himself forward to bundle the ball over the line after Posh ‘keeper Luke McGee had made a fine save from an initial effort on target. That was the ninth Scunthorpe corner of the game. Posh didn’t win one all night, even during a spell of pressure generated by two substitutions and Marcus Maddison emerging from his first-half stupor. Posh full-back Michael Smith shoots at goal. Photo: David Lowndes. Maddison’s crossing ability created half-chances for defender Ryan Tafazolli and Andrew Hughes and a far post opportunity for Tom Nichols that grazed the outside of a post. It was also Maddison’s first-time shot, following a fine pass from Edwards, that forced Scunthorpe goalkeeper Luke Daniels into his only difficult save of the night midway through the half, but Nichols, who met the ball at pace, headed the rebound over the bar. Right-back Michael Smith spurned the only other notable Posh scoring opportunity of the night when poking wide after barging his way into the penalty area. Edwards was also involved in that bright moment, which should help increase the clamour for he, and indeed Angol, to start the next game. An equaliser would have made for an interesting final quarter, but Scunthorpe responded to Posh pressure by withdrawing a striker for a midfielder for the final 15 minutes and they coasted home from then on. Substitute Sam Mantom even missed a great chance to extend Scunthorpe’s lead. It’s been a decent run of form from Posh. If McCann had been offered nine points from the last four League One matches, he’d presumably have moved positively with the speed of Nigel Farage at the sight of a TV camera. Posh: Luke McGee, Michael Smith, Andrew Hughes, Jack Baldwin, Ryan Tafazolli, Michael Bostwick (sub George Moncur, 68 mins), Chris Forrester, Leo Da Silva Lopes (sub Gwion Edwards, 46 mins), Marcus Maddison, Tom Nichols, Shaquile Coulthirst (sub Lee Angol, 46 mins). Unused substitutes: Paul Taylor, Mark Tyler, Jerome Binnom-Williams, Hayden White. Scunthorpe: Luke Daniels, Scott Wiseman, Murray Wallace, Charlie Goode, Stephen Dawson (substitute Richard Smallwood, 53 mins), Josh Morris, Neal Bishop, Holmes, Kevin van Veen (sub Sam Mantom, 76 mins), Tom Hopper (sub Luke Williams, 89 mins). Unused substitutes: Joe Anyon, Jordan Clarke, Hakeeb Adelakun, Paddy Madden. Goals: Scunthorpe - van Veen (21 mins), Bishop (82 mins). Scunthorpe - van Veen (foul).